J. Jane Consulting | estella pyfrom. west palm beach, florida. | wife. mother. aunt. community leader. educator. mentor. trailblazer. I was watching the Superbowl with Mr. Stern when I first heard of Estella Pyfrom. Like many spectators, I love a good game interspersed between really good commercials. I squeezed Mr. Stern’s hand as we watched the Microsoft ad. He smiled and said, “You are calling that lady, aren’t you?” I smiled, grateful that my husband knows me so well. You may recall seeing the Microsoft Super Bowl ad that featured Estella’s Brilliant Bus. Doesn’t ring a bell? It’s the ad that made you feel like you could do anything you set your mind to… remember it now? When I first spoke with Estella Pyfrom, she started the conversation saying, “There is a myth out in the world that says if you work really hard—you will be successful. That is simply not true. You don’t just have to work hard, you must help one another out.” Estella would know. She is one of seven children who grew up working beside her six siblings and both parents to help make ends meet. Estella knows the value of earning a dollar, and she understands the importance of a good education. Estella Pyfrom has much to be proud of: she had an extremely successful career as a teacher turned guidance counselor and she has four beautiful children and 14 amazing grandchildren — you can hear the immense pride in her beautiful voice when she speaks of her family. “They are all out doing good things in the world,” she said a few times during our conversation. After speaking with Estella, you quickly find out that she learned her strong parenting skills from her own parents. At the age of 71, Estella had an idea to bring technology to underprivileged neighborhoods on a bus. Estella saw a gap in the system and wanted to fill it. She came up with Estella’s Brilliant Bus and seven years later she is still rolling strong. Estella Pyfrom had the courage to use her retirement money to solve a major problem. What will you do in your golden years? You are one of seven children and while your parents did not have more than a fourth grade education, they were migrant pioneers with vision and an incredible work ethic. Did they encourage a college education and how did you decide to take that path? Yes. My parents encouraged us all to get an education. School always came first. We worked after school and on the weekends beside my parents, but they knew education was the only way to change our lives and improve our lifestyle. Education was the key to a better living. All siblings went to school, four went to college and three went to trade school. Most people retire in their sixties, but not you. 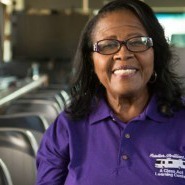 At the age of 71, you envisioned and created Estella’s Brilliant Bus, bringing technology to under-served communities. What advice can you offer to those who do not wish to retire yet, but are not sure how to spend their time and energy? Think about what is important to you and think about how you can share that with others. Look outside of yourself to make that happen. After raising my children, I knew education was critical to their success. After I watched them succeed, I wanted to do that for other children. Knowledge of technology is critical for success and I knew I could help. So I would encourage others to find your passion and then work to develop that passion. Whatever it may be. You are a community leader with unparalleled energy and vision. Estella’s Brilliant Bus has over 34 community partners, you have been named a CNN hero and won Toyota’s Standing O-Vation Award. What has surprised you the most about the outstanding response? I was not surprised that it all came. I knew from the beginning it would be a successful endeavor. But I was surprised about how fast it came. My vision was to be collaborative. I knew if our partners combined our community missions we would have success. I did not have a clue at the speed it would come. My father always said, “ If you can dream something, dream big. If you are willing to work to make it happen, it will happen.” He was right. It takes serious money to operate Estella’s Brilliant Bus. I read that you funded some of this project with your own pension. Did you ever fear failure? If so, how did you work through the fear? No. I never had fear of failure. Not once. I knew set backs were possible, but those are just detours. But I just stuck with my plan and worked hard. I put together a five- year plan and did what I could to execute it. My dad used to say, “ No matter what, just keep working at it. Failure is not an option” and he was right, failure is not an option. We are currently working on our first crowd-funding project. We are appealing to all of our community partners and supporters to help make this happen by visiting EstellasBrilliantBus.org and donate to the campaign. Our plans are to empower at least 100 children with a lifelong experience by involving them in our 2nd annual Tech Innovation Tour during a 10-day road trip (tour). Mentoring and leadership are critical for changing the trajectory for under-served children. With guidance kids lead happier lives and subsequently those kids become healthy adults, creating a stronger economy and healthier society. What do we need to do to inspire leaders to focus on education? I think it’s important to focus on changing the mindset across the board. Little by little, we can do this through the children. We don’t hand out anything to people—we empower them with education. Changing their mindset to help them help themselves. I start every computer session with “When I look in the mirror, what do I see? A brilliant mind looking back at me.” Empower kids to find what they are good at and foster that. Those kids will execute it on their own … but we have to show them the way. I went into this project thinking, “I am going to make a difference.” I wanted to find someone to whom I could consult with who could advise me but I was not successful in locating anyone as this was the only project of it’s kind in the world. Since I could not find anyone to confer with I had to revert back to my years as a poor kid living in the projects. I had to improvise. We used to have to help each other and we learned responsibility at a young age. In some cases, parents miss modeling some important things, like teaching their children responsibility. The responsibility part is critical. I worked as a guidance counselor for many years, it was the number one thing that many children lacked: responsibility. I channeled this type of thinking to move the project forward. And it has been successful. I have had a number of obstacles but my determination was strong. Failure was not an option—never will be. I look at the obstacles, and push myself to work at it a little harder. In 2001 and 2005, I had surgery, experienced vocal cord damage and lost my voice. I was really sensitive about this and did not want to talk. But the people I worked with along the way encouraged me to keep trying. For example, all the producers reminded me that it’s not what you say but more important, how you say it. So I’ve learned to work through it. Also, I started this project at age 71. Admittedly, I did not know much about technology, except for that it was important for me to learn. I was willing to go through trial and error and learned about technology. That was really hard work. I am comfortable with being around people who know more than I do. I recognize that I am a black female, a senior, and am working against the odds, but that doesn’t matter I just keep moving forward. I will not fail. I have a plan and I work my plan. At age 78, I know this, if you set your mind to do something, you can do it. But know that there will be people on the sidelines criticizing you. But the caravan moves on and so must you. You must set your goals, be aware of the challenges from the sidelines. Create a plan, inch by inch everything is a cinch. When I was young, I used to hear school officials say, ‘Those poor migrant kids, they won’t succeed – going to school and working – because they miss so much time out of school.’ But that made us work harder. That was the only option we had. We knew that nothing was going to be handed to us on a silver platter and we needed to work for what we got. As a woman, I think you must think of family first. Business comes after family. All of the things that I have done, the extra jobs, etc. – I always put family first. Now my kids are successful, doing the same for their children. You can juggle activities around family and have a productive good life, and then you will have your family beside you always. One thing I know for sure, is that you can work hard to become successful, but that means nothing when you don’t put family first. Family is of the utmost importance. Never forget it. Have you ever thought about making a difference in the world, but aren’t really sure about how to go about it? Start here – right now. Help Empower Estella’s Brilliant Bus: Kids Tech Tour by reaching her goal of $50, 000. Donate NOW. GET INSPIRED. PASS IT ON. SHARE THE GOODNESS. Awesome interview. Thank you for sharing it. What a great interview. I saw a commercial about this fantastic venture and immediately fell in love with Ms. Pyfrom. What an inspiration! I’m cheering for Estella’s Brilliant Bus!